Four decadently rich Bellafina truffles in our signature green box. Each is handmade of the finest chocolate, fresh cream and butter, nuts, fruit, and other delicious ingredients. 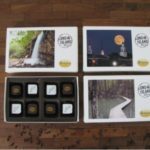 This collection contains a variety of flavors and is available in all dark chocolate or a mix of dark, white, and milk chocolate varieties.